Meet The Popular Venezuelan Candidate With The Best Chance Of Taking On Maduro : Parallels Defying an election boycott, opposition candidate Henri Falcón wants to repair ties with Washington and dollarize the economy. Venezuelan opposition presidential candidate Henri Falcón addresses reporters in Caracas on May 8. The phrase refers to Nicolás Maduro, Venezuela's increasingly authoritarian president, who is seeking another six-year term despite leading Venezuela into its worst economic crisis in modern times. Amid hyperinflation, food and medicine shortages, and the mass emigration of Venezuelans, Falcón claims the only path to progress is for voters to give the boot to Maduro. "People work for a month but don't earn enough to buy a carton of eggs," Falcón tells supporters during a campaign trip to Valencia, an industrial city west of the capital. "That means hunger and misery. But we are going to get rid of this inept government." The polls show a topsy-turvy race. A poll in early April had Falcón up by 7 points, but other surveys in May gave Maduro more than a 12-point lead. Rather than regime change, the vote could wind up helping Maduro consolidate power. That's because of unfair conditions that analysts say will guarantee his victory — and have prompted an election boycott by parts of the opposition. The opposition's most popular leaders — among them Leopoldo López and Henrique Capriles — are in jail, in exile, or have been banned by the government from running for president. Critics say the government is using food handouts and the threat of mass firings of state workers to pressure people into voting for Maduro. Venezuela's electoral board tasked with overseeing the vote is stacked with Maduro loyalists. What's more, the government controls most TV and radio stations and is transmitting a constant stream of of pro-Maduro propaganda — while his rivals get scant airtime. "How do you defeat a candidate like Maduro who has the entire government apparatus working in his favor?" said Luis Butto, a political science professor at Simón Bolívar University in Caracas, who predicts the president will be easily re-elected. Analysts and opposition leaders say that similar advantages as well as dirty tricks — such as moving polling places in opposition strongholds on election day — helped the ruling Socialist Party sweep gubernatorial elections in October and mayoral elections in December. Meanwhile, the opposition coalition of more than 20 parties from across the political spectrum is split over Falcón's candidacy. 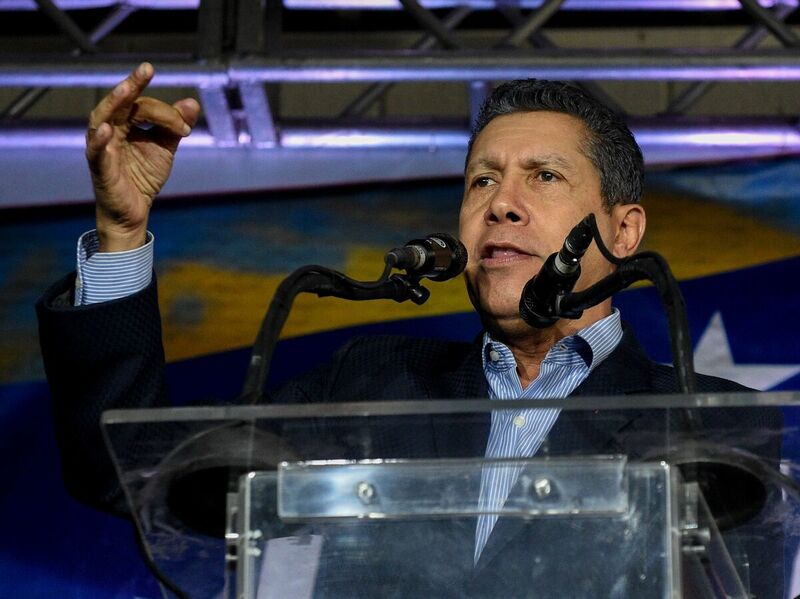 He is considered suspect by many right-wing leaders within the opposition coalition because Falcón, a former state governor, once embraced the socialist revolution ushered in by the late Hugo Chávez 19 years ago. Falcón points out he broke with Chávez a decade ago and has been a staunch critic of the late leader's loyal successor Maduro. What's more, he has pledged to repair relations with Washington, which has increased pressure and sanctions on the government and its associates. He even wants to replace Venezuela's badly devalued currency with the U.S. dollar — a hated symbol of "yanqui imperialism" for die-hard Chavistas, as government loyalists are known. Meanwhile, the largest opposition parties have refused to field candidates and are calling for an election boycott. The United States and several Latin American countries say they will not recognize the results, while the European Union has called on Venezuela to suspend the voting and to organize free and fair elections. Falcón belongs to a small left-wing party called Avanzada Progresista, meaning "progressive advance." He has been expelled from the opposition coalition for defying its boycott. Opposition lawmaker Negal Morales tells NPR that by taking part, Falcón is helping to legitimize an electoral farce. But unfair voting conditions don't always mean victory for autocrats. In 1988, Chilean dictator Augusto Pinochet lost a plebiscite that paved the way for Chile's return to democracy. Two years later, Nicaraguans defied the odds by voting out the Marxist Sandinista government. Falcón is counting on a similar surprise. Speaking with NPR on his campaign bus, Falcón says it's not the time for politicians to go into hiding. He adds: "What sense does it make to tell people not to vote and then provide them with no alternatives?" Francisco Rodríguez, Falcón's chief policy adviser, insists that it's the boycotters who have been duped. "Maduro wants people to abstain. He wants nobody to come out to vote," Rodríguez says. "Because that's the only election he can win. And the opposition fell into that trap." Rodríguez claims that electoral boycotts rarely prove to be an effective means of protest and have often backfired. In Venezuela, for example, the opposition sat out the 2005 legislative elections that effectively turned Congress into a rubber stamp for Chávez and helped him consolidate his grip on power. Taking part in an election under unfair rules "does not mean legitimizing those rules," Rodríguez says. "It means that you are willing to fight for you rights. What we are not willing to do is to let Maduro get away with six more years in power without a fight." For his part, Maduro predicts the elections will be clean — and that he'll win by a landslide. "We have the support of the people," Maduro told a recent news conference. "You can't call that an unfair electoral advantage."